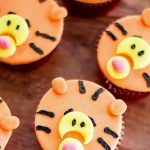 Tigger Cupcakes are super fun to make and the most adorable cupcake ever! Perfect for a Christopher Robin movie night or theme party! Disney’s Christopher Robin movie is already out in theaters, have you seen it? I’ve read that it’s not doing as well in the box office as expected which is a shame because I had many fond memories reading the Winnie the Pooh books growing up. I love the characters so much; we are turning them into super adorable cupcakes here on the blog! 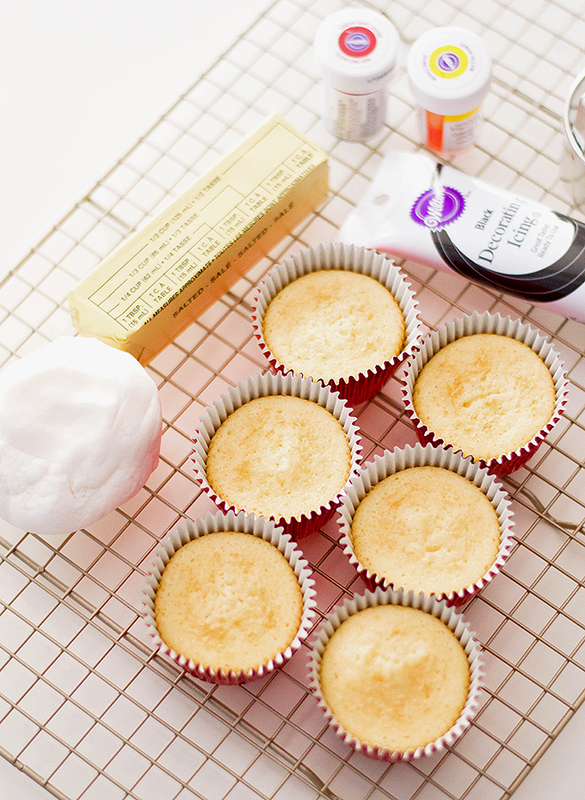 You can make the vanilla cupcakes using a box mix or your favorite recipe. You can also use store-bought and skip the baking altogether. 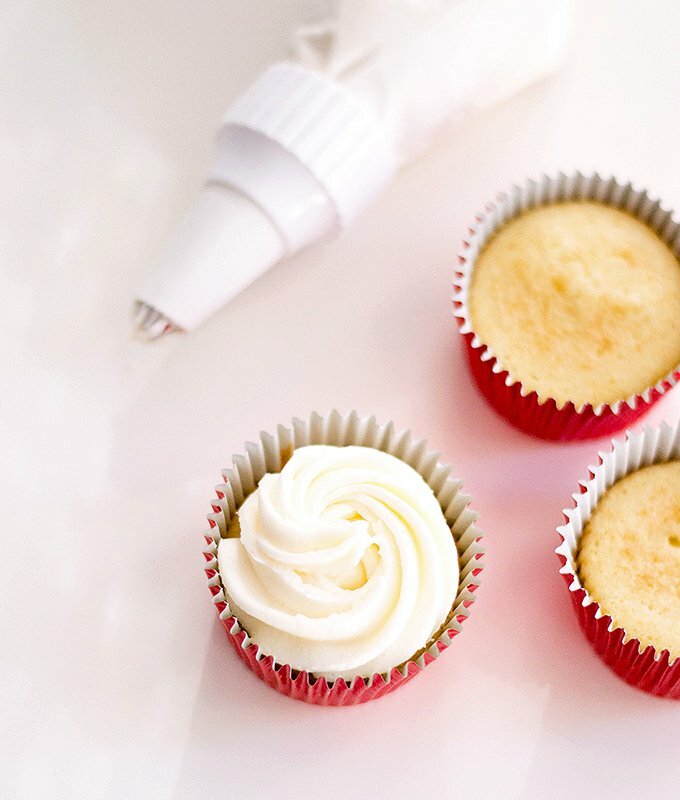 If you choose to bake, use red liners for best effect and make sure the cupcakes are completely cooled before decorating. To simplify the process, use commercial buttercream frosting available at most major supermarkets. 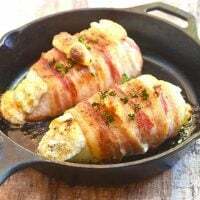 If you prefer to make from scratch, in a bowl, beat softened butter using an electric mixer at medium speed for about 1 to 2 minutes or until creamy. 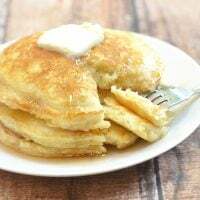 Add 2 cups confectioners’ sugar, two tablespoons milk, and one teaspoon vanilla extract with the mixer on low speed. Increase to high speed and continue to beat for about 2 to 3 minutes. 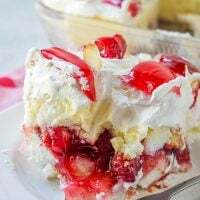 In a bowl, place 6 ounces of the white fondant and add three drops red gel food coloring and two drops of yellow gel food coloring. 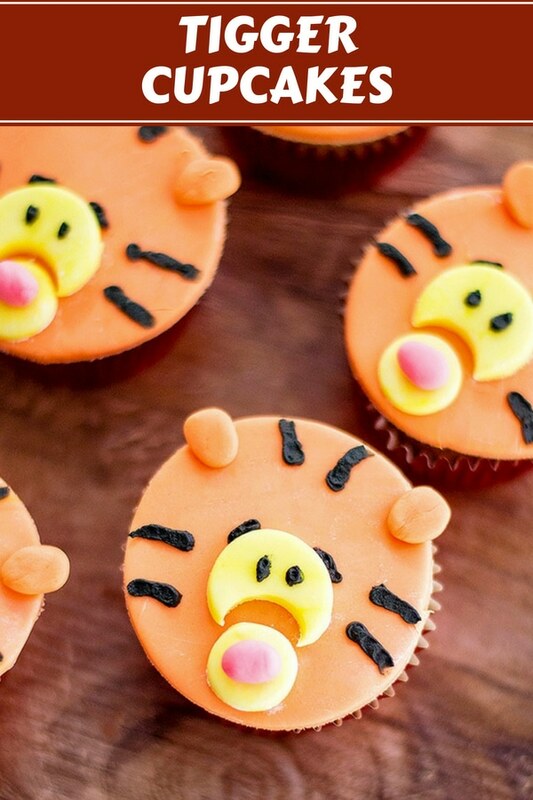 Gently fold together until fondant is of even orange color to resemble Tigger’s face. Sprinkle a clean work surface and a rolling pin with cornstarch. Using the rolling pin, roll the orange fondant to be about ¼ of an inch thick. Using the largest cookie cutter, cut out 12 circles and place on a baking sheet lined with wax paper. 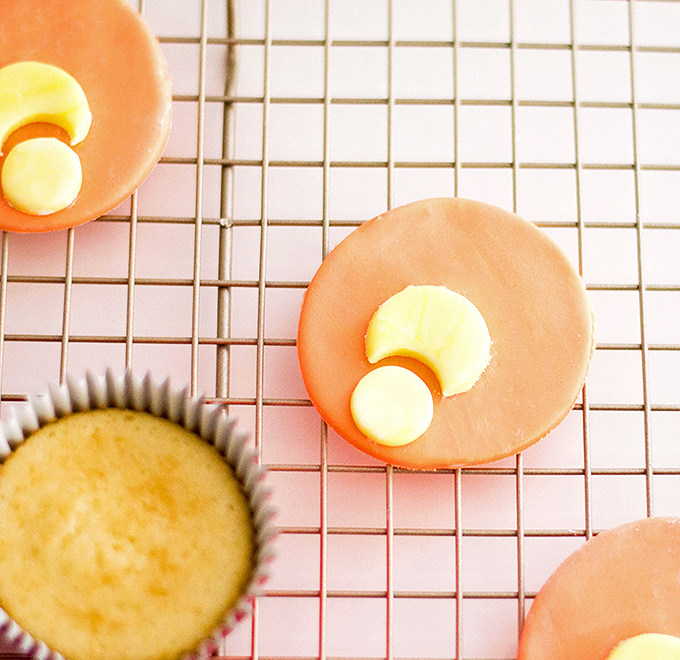 Shape the remaining orange fondant into 24 small circles to resemble Tigger’s ears. Set aside. In another bowl, place 1 1/2 ounces of white fondant and add 2 drops of yellow gel food coloring. Gently fold together until fondant is evenly colored. Using a rolling pin, roll out the yellow fondant to about ¼ inch thick. With the medium-sized cookie cutter cut out 12 circles and with the smallest cookie cutter, cut out another 12 circles. With the smallest cookie cutter, cut out a small portion off the middle-sized yellow fondant circle into a crescent shape. In another bowl, place the remaining white fondant and add one drop of red gel food coloring. Gently fold until of even pink color. Roll out the pink fondant into 12 small spheres and flatten slightly to resemble Tigger’s nose. To assemble Tigger’s face, brush water on the back of each piece and gently press onto the large orange circle to secure. Using the black decorating frosting, draw eyes, eyebrows, and tiger stripes on the assembled face. 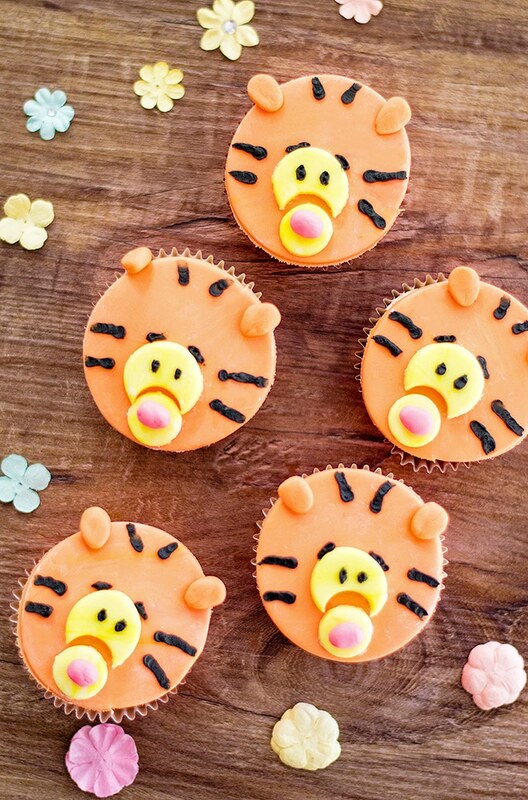 With a piping bag, frost each cupcake and carefully place fondant Tigger face on top. 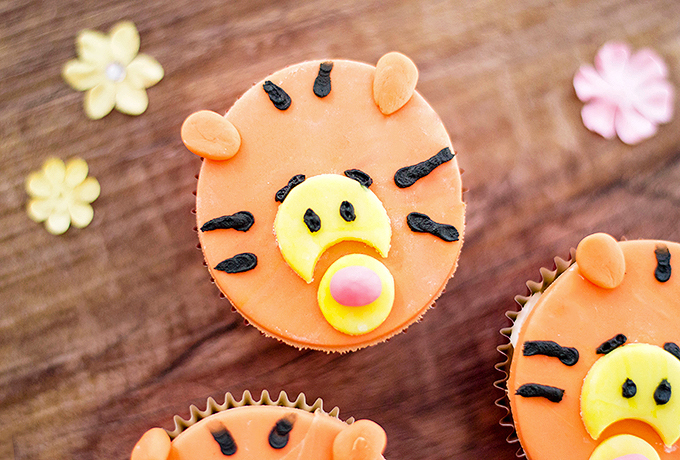 These Tigger-inspired cupcakes are just too cute for words. 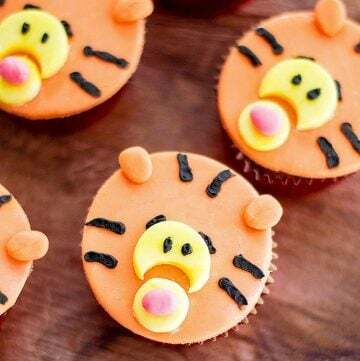 Together with Winnie the Pooh and Piglet cupcakes, they’re the perfect sweet treat for movie night or theme party! Looking for more creative projects to make with the whole family? 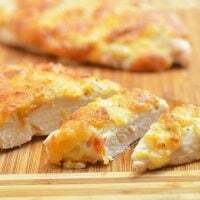 I have a whole section devoted to fun food just for you! In a bowl, place 6 ounces of the white fondant and add 3 drops red gel food coloring and 2 drops of yellow gel food coloring. 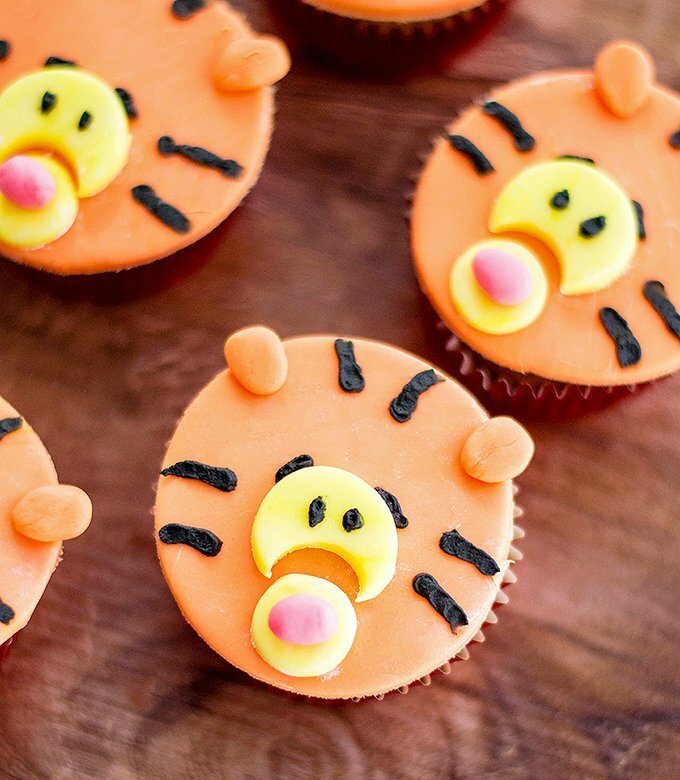 Gently fold together until fondant is of even orange color to resemble Tigger’s face. Using the largest cookie cutter, cut out 12 circles and place on a baking sheet lined with wax paper. Shape the remaining orange fondant into 24 small circles to resemble Tigger's ears. Set aside. With the medium cookie cutter cut out 12 circles and with the smallest cookie cutter, cut out another 12 circles. These little guys are so cute! Can’t wait to make them with my niece! These look super cute!! Can’t wait to see the other ones that you have made. We’re also Disney obsessed, so these cut e little cupcakes are perfect! My kids will want to help out cutting the shapes and decorating them. We LOVE all things Disney!!! 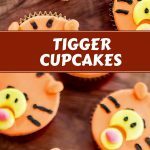 These Tigger cupcakes are sooo cute! I am just worried that mine would not look as great as yours! Thanks, Dawn! Yes, I am sure the kiddos will love these cupcakes. They’re so fun to eat!